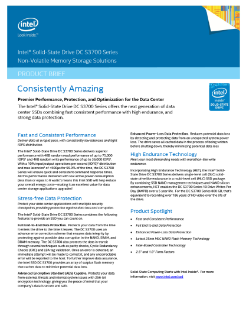 The Intel® Solid-State Drive DC S3700 Series (Intel® SSD DC 3700 Series) offers the next generation of data center SSDs, combining fast consistent performance with high endurance, and strong data protection. Deliver data at a breakneck pace, with consistently low latencies and tight IOPS distribution. The Intel® Solid-State Drive (Intel® SSD DC S3700 ...Series) delivers superior performance with 4KB random read performance of up to 75,000 IOPS and 4KB random write performance of up to 36,000 IOPS. With a 10% input/output operations per second (IOPS) distribution and max latencies of <500µs for 99.9% of the time, the Intel® SSD DC S3700 Series will ensure quick and consistent command response times. All this performance delivered with low active power consumption (less than or equal to 6 watts) means this Intel® SSD will help reduce your overall energy costs—making it an excellent value for data center storage applications upgrades. Protect your data center applications with multiple secure checkpoints providing protection against data loss and corruption. The Intel® SSD DC S3700 Series combines features to provide an SSD you can count on.